Every war continues to dwell in the lives it touched, in the lives of those living through that time, and in those absorbed by its historical significance. The Vietnam War lives on - famously or infamously, depending on political points of view - but those who have “been there, done that” have a highly personalized window on their time of that history. Valor in Vietnam focuses on nineteen stories of Vietnam, stories of celebrated figures in the veteran community, compelling war narratives, vignettes of battles, and the emotional impact on the combatants. It is replete with leadership lessons and valuable insights that are just as applicable today as they were forty years ago. This is an anecdotal history of America’s war in Vietnam composed of firsthand narratives by Vietnam War veterans presented in chronological order. They are intense, emotional, and highly personal stories. Connecting each of them is a brief historical commentary of that period of the war, the geography of the story, and the contemporary strategy written by Lewis Sorley, West Point class of 1956, and author of A Better War and Westmoreland. With a foreword by Lt. Gen. Dave R. Palmer, US Army (Ret. 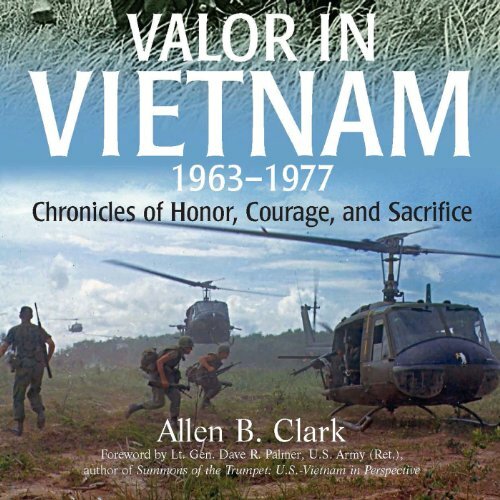 ), Valor in Vietnam presents an overview of the war through the eyes of participants in each branch of service and throughout the entire course of the war. Simply put, their stories serve to reflect the commitment, honor, and dedication with which America’s veterans performed their service. ©2012 Allen B. Clark (P)2013 Audible, Inc. I must say at first this book didn't really grab my attention. It seemed as though the first portion was focused on facts and knowledge of the war. What LBJ knew or didn't, Tonkin incident, etc. it all seemed to blend together and my mind tended to wander while listening. However, the second part of the book captured my attention with stories of prison camps, medics, pilots, basically a more true to the title way of writing. Overall, I finished the book questioning what I missed in the first section. I'll have to give it another listen because I remember a lot more stories from the second part rather than first. Not a bad read for military buffs and veterans. You won't walk away from this book without remembering at least a few of the stories for a long while, and perhaps grateful for what some unknown Americans did during that war. Only one word comes to mind....Valor. Where does Valor in Vietnam rank among all the audiobooks you’ve listened to so far? I've listened to just a few, usually books I know are good, so the competition is tough. It's definitely not in the lower third, but it's hard to say it's up there with Dune or The Caine Mutiny. What was one of the most memorable moments of Valor in Vietnam? When a colonel made a poor decision about yelling at a wounded soldier fresh in from the fight. What about Corey Snow’s performance did you like? He's got a good voice and is good at letting you get into the story. It helps convince you that we shouldn't send our soldiers into a war unless we're quite sure it's necessary - it's a terrible thing to do to a man, sending him to war. Clearly a good book, interesting and well sourced material but narrated in the most boring, flat way that makes it extremely difficult to absorb. Had to listen two or three times to some segments just for it to sink in - this would not be the case if I were reading the book. Narrator also reads obvious typos/editing errors verbatim and some pronunciation is incorrect. One bit in particular that will make any UK listeners cringe is the attempt at an English accent whilst reading a Kipling quote. Shame - good book ruined.